Tony Echavidre is a master luthier following in the footsteps of the great Baroque and Renaisssance craftsmen of the past. Living and working in the histioric city center of Bordeaux, he aspires to honor the roots of his tradition, while also carrying it forward through the discovery and exploration of his own creative style and voice. How did you come to be a luthier? Growing up I was around a lot of creativity, because my mother is an artist and my father's a chef, so by the time I was a teenager I was looking for something that would allow me to follow my own inspiration. Then one day I came across a violin maker, and my first response was one of shock—I thought, 'wow, this is so great, but how could it be?' I'd assumed this craft was no longer practiced, and was so inspired to see people still making instruments as they used to in the Renaissance and Baroque times. So I went to a workshop of a famous violin maker, where I discovered it was possible to learn the trade in school. I entered a school in Newark-on-Trent in England, and studied there for four years. When I finished my studies I just kept going along on this path, and little by little over time I learned more about the craft and its history. I traveled to Cremona, which is the historic capital of violin making, and apprenticed at a workshop. While I was there, I saw many beautiful instruments at museums and in the hands of musicians. Yes, there's so much to be found in the works of great masters like Guarneri and Stradivari, and when you're starting out it’s very natural to strive to copy and replicate them... and today many makers are very good at this. However at a certain point in my own development I realized I didn’t want to spend thirty more years in a workshop learning to make instruments exactly like the master of a particular style... I felt there was something missing in this, and that I needed to find my own voice. So I decided it would be better to learn and discover certain things by myself, even if it took more time and maybe more mistakes. I felt this would allow me to try out different things and develop my own personal style, because the great masters didn't just copy other works, they created their own models too. I believe this is part of the history of the craft—you start with what comes before, which fills you up with knowledge and inspiration, and then you make something new out of it, and find your own personality through the way you work. Well I wouldn’t identify myself as an artist —I’m a craftsman— but it's true that there's an element of art in this work. If you don't have a bit of artistic style and expression then your work is not alive; you make things without soul. So you need this soul, this artistic point of view of what is right and what is beautiful. It comes from the way you feel. The instrument should express something when you look at it—it's not just an object, it’s a living thing, and through the work you imprint something into the wood that in the end gives it a voice... it sings, it expresses. Then it becomes an extension of the voice of the musician —a companion— and together they can make one voice. 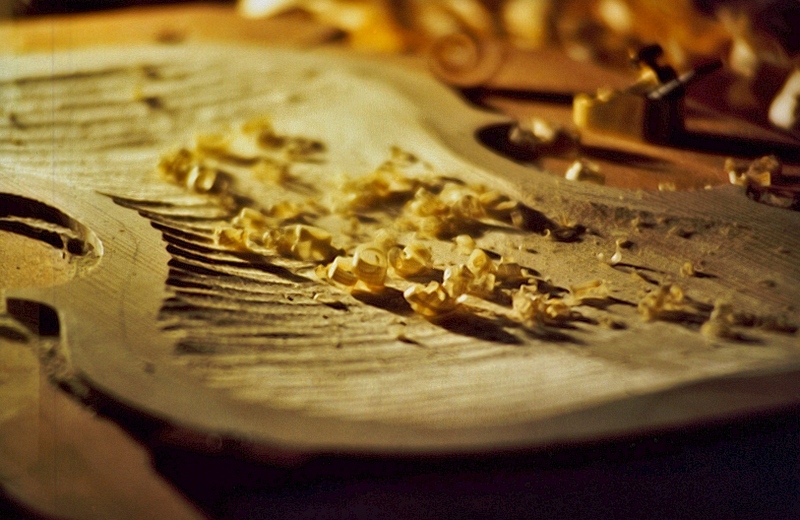 What is the first step in the violin making process? The first thing we do is create a drawing. You start with the drawing, then from this you can make a mould, and out of the mould you create the instrument. These drawings are often based on representations of instruments created by the masters, which we use as studies. This process may look simple, but it's actually quite difficult to do properly. After many years you can learn to draw them very well, but when you start you don’t realize if you change even the slightest thing it will affect the entire process. Yes exactly, it’s like a recipe. And once you get used to working with a particular recipe, you can stay very close to the original ingredients, or you can move out from there and experiment. Because again, you can make a perfect copy, but a great violin is not simply the result of a pure geometrical way of making something... there's an interpretive dimension to the process. Take Stradivari for example, he had a lot of knowledge of how to draw any instrument, but instead of using the exact blueprint, he thought 'ok, well I can move this out a little here, and add these small asymmetries and imperfections...' so he had this way of thinking that went beyond simply craft-making into true artistry, which is a balance between these two approaches. If you’re too scientific you lose the feeling, but if you have too much feeling then sometimes you may make great instruments, but sometimes you make poor instruments... you are inconsistent, because if you always trust your feelings then you're going all over the place. And I imagine the wood and the finish affect the sound as well? Yes absolutely, the material is very very important. Where do you find the wood today? There are many specialists who source it. They go into the forest to select a tree, cut it down and dry the wood, then bring it to the violin makers and we decide what best suits what we are looking for. It’s like going to a market where the chef knows exactly the ingredients he wants to select for his meal. Working in this way you develop great feeling with your senses—you touch the wood and see how it feels, and listen for a certain type of sound it makes when you cut it... these things already give you an idea of where you're going, but without your senses you have no real reference. So relying on your senses becomes second nature. Yes, and with the varnish it’s the same. When you look at instruments from the past, their varnish is just so beautiful—the color, the contrast, the reflection... it creates these 3d illusions that are just amazing; so most of us violin makers are addicted to the varnish, we really want to copy that! And what materials do you use for this? Well it’s actually my own recipe, and it’s made from rosin (from the sap of trees). We in fact collect the resin for it in this region because it’s of a very high quality. This profession was in activity here for a very long time, and then it all but stopped, but now it's starting up again. It’s an old trade, and there are really interesting people in it. I’ve been in communication with one such collector, and have learned about the way they collect it, and how the quality can change depending on the bending of the tree, or the phases of the moon and the seasons; all of these factors really change the quality of the resin. Yes it’s local, and we use only very pure ingredients. For example I use the organic essential oil of turpentine, but if you buy common turpentine at the store, you don’t know what it’s made of... which is not good for your health, or the instrument. When you work with these kinds of materials you feel good, because it’s local, it’s organic, and you work with people that have a lot of knowledge about the craft. Yes some makers like to copy the aged look. I also do this sometimes, because when an instrument is new and shiny it can look very modern, and this is not the look most people really like. When you make it look slightly older, this can add more character and variation. You can create many interesting things to look at with the grain and the flames, and little gouge marks in the wood, which we make by hand with cutting tools. These imperfections are very important; when the body of an instrument is slightly irregular and not perfectly symmetrical, it’s just like a human face—we too are not exactly symmetrical, we are not perfect. Exactly. So you have to be very focused, and always be learning from what you've made before... and it’s a constant process. You have to be very precise to make things that are well made, and the details are very important, because it's often the little touches that make the whole instrument truly come alive. So through my work I hope to be original and unique, and at the same time carry on this tradition with respect for the craft and the people that came before me. And since I’m still young, and hopefully have a long life to live, then maybe I too will make something of my own to leave behind... because it really does take a lifetime.